Extract from a public talk. In the illiterate world of Christendom depictions of Biblical characters were standardised  Paul, balding with a hooked nose, Peter with grey curly hair and a beard, etc.  so that the faithful could immediately recognize them. Papyrus P45, f. 6 – Chester Beatty collection. Earliest fragment of the Mark (part of chapter 7), dated to around AD 250. Keeping the Good News Quiet! "Jesus and his disciples went on to the villages around Caesarea Philippi. On the way he asked them, 'Who do people say I am?' ... Jesus warned them not to tell anyone about him." "Once when Jesus was praying in private and his disciples were with him, he asked them,'Who do the crowds say I am?' ... Jesus strictly warned them not to tell this to anyone." "When Jesus came to the region of Caesarea Philippi, he asked his disciples, 'Who do people say the Son of Man is?' ... Then he warned his disciples not to tell anyone that he was the Christ." But when we come to examine them, one startling fact confronts us: all of these books relate to a personage concerning whom there does not exist a single scrap of contemporary information – not one! In the Augustan age historians flourished; poets, orators, critics and travelers abounded. 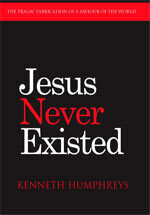 Yet not one mentions the name of Jesus Christ, much less any incident in his life." 120-140 is the most likely time for the writing of Mark's gospel  by Cerinthius. The Cerinthians were a group founded in the 140s who used Mark's gospel exclusively. Another possibility is that 'Markos' is a an allusion or tribute to Marcion, the shipping magnate from Pontus who in the first half of the 2nd century led the Pauline faction. 1st or 2nd century dating? Markan phrases such as "wars and rumours of wars", "earthquakes and famines", have given rise to much speculation. The Jewish War, though failing to presage an immediate end-time, was nonetheless interpreted by early Christians as evidence of the "birth pangs" of the end-time. Mark's vision of Pharisees wandering around Galilee might suggest a composition before the term Pharisee fell into disuse – unless, that is, the author was consciously setting the scene with this time marker. In any event, Mark has to predate Matthew, and Matthew appears to be have known to Polycarp in the mid-2nd century. Matthew and Luke were clearly intended to replace the original gospel of Mark but that hope failed. Thus, to minimize the number of embarrassing contradictions between the original and later stories, a number of minor harmonizing changes were made to Mark's text, such as the insertion of the word "Nazareth" in Mark 1.9. Nazareth was not in Mark when Matthew copied the passage into his own gospel at 3.13! 2000 Gadarene swine go over a cliff. Local sausage industry collapses. Thanks, Jesus. "And forthwith Jesus gave them leave. And the unclean spirits went out, and entered into the swine: and the herd ran violently down a steep place into the sea, (they were about two thousand); and were choked in the sea." The 'angel' who appears at the tomb is, in fact, an actor who recites dramatic lines that were created for him, first by the early Jerusalem community (in Aramaic) and then by the evangelist Mark (in Greek)." – Sheehan, The First Coming, p157. Josephus, witness to 3 friends being crucified. One was taken down – and survived. Though for much of Christian history the gospel of Matthew has been given primacy that honour actually belongs to the gospel of Mark, the shortest and least sophisticated of the Jesus stories. Mark's literary creation was the starting point for both Matthew and Luke. Of approximately eleven thousand words found in Mark, ninety-five per cent of those words – entire paragraphs and stories in fact – are reused in the gospel of Matthew and sixty-five per cent of them in the gospel of Luke. Contrariwise, where Matthew and Luke differ most from each other – in the nativity and resurrection episodes – it is in material not found and not copied from Mark. Thus, to understand the trajectory by which the Jesus tale developed from an original hero – a righteous man infused by God's holy spirit– through a hybrid godman possessing powers, to find final form as God incarnate on earth, one is best advised to begin with Mark's pithy masterpiece. "Those who affirm him to have been a man, and to have been anointed by election, and then to have become Christ, appear to me to speak more plausibly than you who hold those opinions which you express." – Trypho to Justin, Dialogue with Trypho, XLIX. Between the era of the Maccabees and Bar Kochba's war (approximately 160 BC to 135 AD) the increasingly radicalised factions of the Jews were animated by an expected warrior/priest (or perhaps a warrior and a priest) who would lead the 'nation of Israel' in triumph. The expectation was thus of someone in the (imminent) future, no doubt of 'Davidic' or even 'divine' lineage but otherwise, human. 3. destroyed dozens of towns and hundreds of villages throughout Palestine, decimating the Jewish population and leading to the enslavement of tens of thousands. With this in mind, we should not relate Mark to a spurious 'persecution of Christians by Nero' (a reasoning favoured by Christian writers)  but to the very real suffering of a whole nation. Judaism itself was against the wall. The weakness of its position had been exposed. The Hebrew god had always punished his chosen people because they had failed him: they had not obeyed the Law. But always the Jews had redeemed themselves  and lived to transgress again. But in 135 Judaea was wiped off the map and the nation dispersed. For any individual Jew, the heart of the problem was that the 'covenant' was between the Jewish god and the whole nation of Israel. All had to observe Righteousness. The errors of one bad apple imperilled the whole people. With the ultimate disaster of 135, for many unhappy Jews the theology of a 'national salvation' (or none at all) no longer gave hope. As Josephus said, God was now with the Romans. Josephus remained a Jew but reasoned the caesars were god's instrument of retribution. No doubt many despondent Jews apostatised and adopted one or other of the pagan faiths. At this low point, the need was thus created for a radical revision of the Jewish faith. The nation of Israel might perish but surely a 'way' could be found for the pious to save themselves? The answer was a new covenant between the individual and his god, for a path to a personal salvation similar to that on offer from the pagan mysteries. As the dispersed and desperate bands of Jews struggled with the problem, they must surely have asked, 'How had (Jewish) scripture failed them so badly?' Rather than doubt the veracity of their 'ancient oracles', priests, safeguarding their future role, deliberated and reached the conclusion that the fault was not in the texts but in the Jews themselves. On cue, as foretold, the Messiah had arrived!  but the Jewish nation  the Jews collectively  had failed to recognize him!! Even his hand-picked disciples had proved to be dullards, repeatedly failing to understand the divine message or carry forward the messianic legacy. As a result the ferocious god Yahweh had punished the Jews even more mercilessly than he had punished them in the past. Here, new meanings teased out of old scripture (in good 'midrash' tradition) provided the answer: he would have been in disguise; he would have concealed his messiahship. The new theology needed to be woven into a convincing story, one that could be read aloud to groups of dispirited Jews. From the moment the proto-Christian priests adopted the conviction that a messiah had been and gone, the hunt was on to identify the missed saviour. Temple records and much else had been lost in the wars (some, of course, secreted away in jars at Qumran to be discovered twenty centuries later) but fragments, half-remembered stories and the rich corpus of pagan mythology would provide the missing detail. If the letters of Rabbi Saul (aka Paul) were available to them at all, they contributed only the popular gnostic idea that the 'risen Christ' reigned in heaven and was a wholly spiritual agency, who would descend on a cloud at the End Time. For the proto-Christians this arrival would be a second coming; they were about to fabricate the first. In the story that emerged, the Gospel of Mark, essentially, the author composites more than fifty 'micro-stories' (mainly healings and miracles, of the type told of Apollonius), sandwiched between a put-down of John the Baptist (whose followers were serious rivals to the early proto-Christians) and a dying-saviour sequence (of the kind then being officially promoted for the dead Antinous. In resolving the theological conundrum that 'the messiah had been but had gone unrecognised' Mark has to have his hero perform endless miracles but then command the persons healed, onlookers, disciples, and even demons to silence (1.34; 1.44; 3.12; 5.43; 7.36; 8.26; 8.30; 9.9). The entity that brings the Word tells them all to keep quiet about it! Of course, this introduces an inconsistency  whole towns witness his deeds!  but then inconsistency permeates the entire bible. Mark's short story is one of suffering (and the Jews were suffering), leading to a place in the soon to arrive 'Kingdom of God ' for believers. Mark begins building his Jesus based upon the 'suffering servant' of Isaiah. The hope therefore is that the present agonies will soon end. But in this first of the gospels, there is no genealogy; there is no star, no nativity pageant, no Bethlehem. Mary is mentioned by name once only (probably a later interpolation) and Joseph not at all. Jesus actually disowns his family (3.31,35); they in turn think he's gone mad (3.21). This can hardly be the Mary visited by an archangel, who 'rejoices' in the 'great things done to her' when she receives her divine pregnancy! There is no flight to Egypt, nor murder of babies, no 12-year-old in the Temple. None of this has yet been written. Guided by the Holy Spirit – or merely plagiarism? "What is thy petition, queen Esther? and it shall be granted thee: and what is thy request? and it shall be performed, even to the half of the kingdom." "Ask me for whatever you wish, and I will grant it. And he vowed to her, "Whatever you ask me, I will give you, even half of my kingdom." In the original tale, the royal chamberlain Haman dies. In Mark's copy John the Baptist dies! Nor has Mark's Jesus yet become the perfect being of the later gospels. His hero is a 'Son of God' but nonetheless one with human characteristics. His Jesus appears sorrowful (14:34), disappointed (8:12), displeased (10:14), angry (11:1517), amazed (6:6), and fatigued (4:38). In Nazareth, he was unable to do 'powerful work' because he was not believed in. 'Like a dove' the holy spirit had descended on him at baptism; presumably before this he had been a mere mortal. The first half of Mark (chapters 1 - 9) is a catalogue of miracles and exorcisms, quite a lot of it repetitive (he uses the word 'immediately' more than 40 times! ), plus a whole bunch of parables, which serve only to baffle his followers. Taking a more theatrical turn, Mark has his Jesus 'transfigure' into a glowing figure on a convenient mountain top where he is addressed by a speaking cloud confirming him as Son of God. Thereafter, Jesus resumes the role of perambulating exorcist on the road to Jerusalem. There follows a curious chapter of 'End Time' prophecy (chapter 13): Why the prophecy at all? It was widely known that Jesus ben Anania, in 62 AD, had made such a correct prophecy (as recorded by Josephus in 79 AD). Mark wanted his hero to have no less a gift of prophecy, so he took the most well-known example of a 'successful' prophecy of the time and re-worked it. The world went on, despite the fall of the Temple, so Mark has Jesus say the end shall not be yet. (13.7). Mark is discounting any idea that the destruction of the first Jewish war would have signalled the end time  indicative that he was writing long after conflict of 66-70 AD. Famously, the godman says you shall hear of wars and rumours of wars, which nicely covers all the subsequent rebellions of the early decades of the second century. All this prophecy of the so-called little Apocalypse of Mark 13 actually fits much better a later date. The remainder of Mark is taken up with 'the Passion' and oddly, the original Mark ends abruptly  and without sight of any resurrected Christ! Frightened women flee an empty tomb and 'tell no-one' (16.8). Unabashed later Christian writers will add an improved, more satisfying ending. "Mark virtually invents a new Pilate – a well-meaning weakling solicitous of justice but, as Mark depicts him, intimidated by the chief priests, within his own council chamber and by crowds shouting outside, so that he executes a man he suspects may be innocent." The 'weak' Pilate of Mark grows increasingly more mellow in successive gospels. In Mark 15.14 Pilate appeals to the obdurate Jews not to 'demand' the execution of an innocent man. "Why, what evil has he done?" he pleas. Matthew has Pilate literally "wash his hands" of the execution (Matthew 27.24), establishing his (and Rome's) innocence. John's Pilate is actually "afraid." His treatment of the character has the Jews threatening to overrule him! It doesn't end there. In time, Jesus scribes succeeded in turning Pilate into a Christian (Origen, Hom., in Mat., 35) and – in the case of the Ethiopian Church – a Saint! A supposed 'letter' from Pilate to Emperor Tiberius almost converts the old debauchee to Christ (apparently he doesn't for "fear of the Senate"! Josephus confirms Philo's judgment, recording several episodes of Pilate's brutality and contempt for the Jews. In Judea "a great number" were slain protesting an aqueduct. In Samaria, "a great band of horsemen and foot-men ... fell upon those that were gotten together", an incident which provoked protests to Vitellius, Roman Legate of Syria. Vitellius, rather more sensitive to geopolitical considerations, removed the Prefect who had plundered the province of Judea for a decade. Pilate returned to obscure retirement in Rome – blissfully unaware of the fame and infamy that awaited him. Christian writers (as early as Irenaeus) have used this earliest possible date for Mark as definitive  making the jump that as there are no obvious references to events later than 70 AD, we have Marks date of origin. However, a well-known event like the fall of the Temple could have been placed in the story anytime after it had occurred, as early as 70 AD  or as late as 170 AD ! The real clues are more cryptic. In the 90s the Jews first introduced a curse upon apostates and Jewish hostility to the Jewish/Christian heretics was greatest between 100 - 120 AD. The second Jewish war, unfortunately, did not have its Josephus to record the events but it was, in fact, a larger conflict. It had the more profound consequence of wiping Judaea off the map. 3. A final clue is a cryptic reference from Daniel 9.27 which in the original referred to Antiochus profaning the Temple of Jerusalem c.165 BC, with an image of Zeus. Some have speculated that this refers to Caligulas intention of placing a statue of himself in the Temple, announced in 40 AD. But the statue was never erected; Caligula was assassinated in 41 AD. Now in fact Hadrian purposefully modelled himself on Antiochus Epiphanes and the catalyst for the second Jewish revolt was his erection of not merely a statue of Zeus/Jupiter, along with his own image, but an entire temple to the god. The most terrible war followed. The little aside that Mark adds 'Let the reader understand' seems to indicate that he knows calling the temple of Jupiter 'an abomination' could be regarded as seditious, and Hadrian came down hard on the Jews after the war of 135 AD. If Mark were just referring to the desolation caused by the first war, the aside does not make sense. Even the Romans, at least according to Josephus, were sorry about the destruction of the Temple. One should also note that the reference to 'flight in winter' had specific meaning for the events of the second Jewish war. It was in winter that the Roman armies partially withdrew to regroup, making a flight possible. Nothing like this happened in winter time during the first war. In the aftermath of the first Jewish War (66-73) remnants of the Essenes, began calling themselves the 'Church of God'. Their now dead Teacher of Righteousness assumed retrospectively the mantle of the Messiah. Challenged as they were by Gnostics (proponents of an entirely divine Christ) and in a desperate attempt to renew and widen their membership, they embarked on the process of romanticising the life of the half-forgotten hero. The process of 'creative biography' was not lost on the Paulites, working the ghettoes of the Greek cities. From the onset of the war, refugees from Palestine had flooded into the city of Alexandria, taking their cults with them. Partisans of Pauls celestial superman, agitating for support in the crowded Jewish settlements, faced their main challenge not from Gnostics or Essene survivors but from the baptisers  both followers of John the Baptist and the sun-worshipping Therapeutae. Like the Paulites, the baptism factions had escaped the carnage of the war by refusing to be drawn into a fight with the Romans. The followers of John, with a real dead hero and martyr, presented the greater challenge. The death of Paul – or whoever the New Testament character "Paul" was based upon – left a void in the leadership of the 'gentile faction' within the proto-Christian movement. To preserve and defend themselves they wrote a story of a 'Jesus' character, inspired partly by the life and teachings of Paul himself. In what proved to be the most profound act of religious synthesis Pauls Judaised pagan sun-god was given human form and placed in a recent past. To win over the Baptists, a clever story was woven. Firstly, the baptists importance was acknowledged but John is conveniently quoted as saying that one greater than he will follow (Mark 1.7). A less than celestial Jesus is then conjectured and given a connection to the baptist  Jesus, it would seem, like any other follower, had gone to John to be baptised! The theology here is very weak  why would the superior and sinless Jesus have need of a baptism of repentance from the inferior, born with sin, John? Apparently, at this point the Holy Spirit had worked its magic and had enlightened Jesus as to his mission (and the Spirit like a dove descending upon him) (Mark 1.10)  and this, for the same Pauline Christ that had existed since the world began and presumably knew a thing or two!  (Mark 1.14). In less than three hundred words, the baptist was disposed of! With John safely out the way, Jesus began his own ministry, coming out of the shadows (or rather, the ether) and taking on a public role (in a Palestine, a half century earlier). The fictitious life of Jesus has been overlaid on the real life of John. The divine eagle had landed. Yet it pleased the LORD to bruise him. The Paulites could now defend the ignominy of their fallen heros wretched death by scripture  but they faced an uphill struggle. The later Matthew re-write will add tomb guards, cast off burial clothes and ecstatic women  it is they who have the first, uplifting encounter with the risen Christ. But for the moment, the crucifixion/resurrection is a flimsy finale to a gospel taken up more with baptism. If many Jews remained reluctant to accept that a pacifist messiah had already lived and died it was because their vast messianic hopes in no way included a pathetic criminal, hanging limp on a cross. ... so I made this request to Titus, that my family might have their liberty: I had also the holy books by Titus's concession. Nor was it long after that I asked of him the life of my brother, and of fifty friends with him, and was not denied. When I also went once to the temple, by the permission of Titus, where there were a great multitude of captive women and children, I got all those that I remembered as among my own friends and acquaintances to be set free, being in number about one hundred and ninety; and so I delivered them without their paying any price of redemption, and restored them to their former fortune. And when I was sent by Titus Caesar with Cerealins, and a thousand horsemen, to a certain village called Thecoa, in order to know whether it were a place fit for a camp, as I came back, I saw many captives crucified, and remembered three of them as my former acquaintance. I was very sorry at this in my mind, and went with tears in my eyes to Titus, and told him of them; so he immediately commanded them to be taken down, and to have the greatest care taken of them, in order to their recovery; yet two of them died under the physician's hands, while the third recovered."